Poverty expert Dr. Donna Beegle gave the second keynote address at the 2012 Oregon NAME (National Association for Multicultural Education) Conference held at Parkrose High School in Portland, Oregon. The sketchnotes above capture some of the ideas discussed by Beegle during the keynote. In her address, Beegle challenged head on the following misconceptions that permeate society: that everyone in the United States has the same opportunities available to them; that if you don’t make it it is because of your own deficiencies; and that all of the people who have achieved success in this country have earned it. Education is touted as a change-agent, a resource that gives individuals the power to lift themselves up out of poverty. But so long as middle-class bias permeates the education system, that system will remain inequitable. 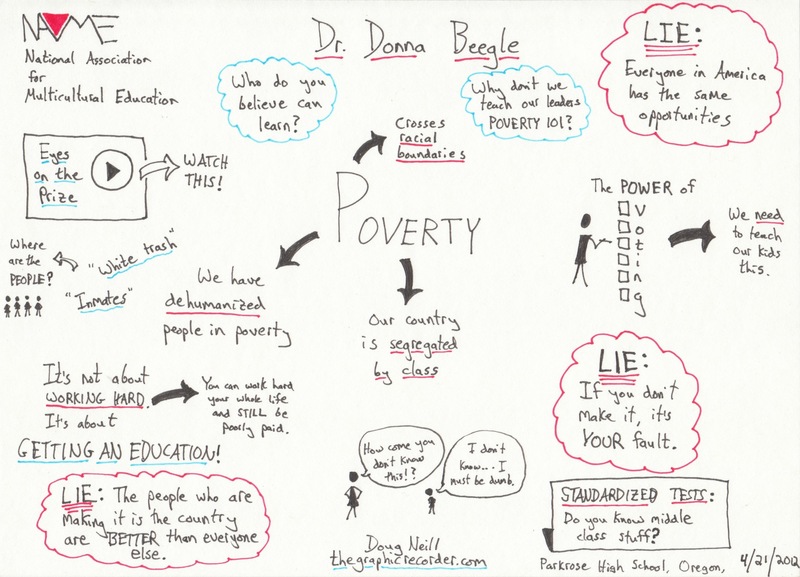 If you are interested in reading more of Beegle’s work, check out her book See Poverty . . . Be the Difference!.